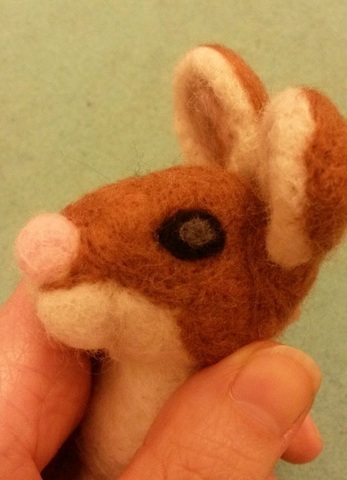 My first ever needle felted animal back in 2013 was a sweet little white bunny holding a carrot. 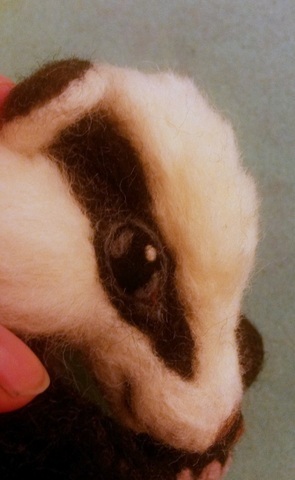 He seemed to just emerge out of my wool the moment I started stabbing away and sculpting with my barbed needles! From that day I just knew this was the hobby for me! It has been a journey of joy in creating, therapy and relaxation through the tough trials that life brings and through my own experimentation it has hopefully helped others as I journal and share my techniques as tutorials. 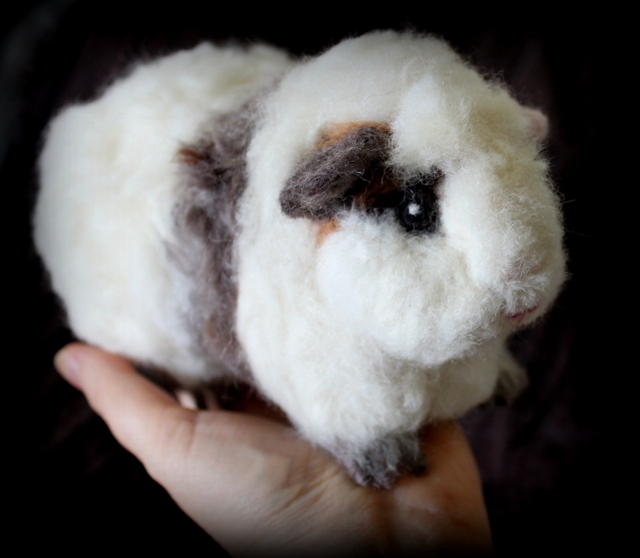 Needle felting is such a wonderful art form as it enables you to just go for it with whatever you want to make, with no need for a pattern or sewing, just your passion and imagination. If you make a mistake it doesn’t matter – it is forgiving and each time you create something new the result brings a smile! As some of you have come to know, I love to improve and challenge myself. 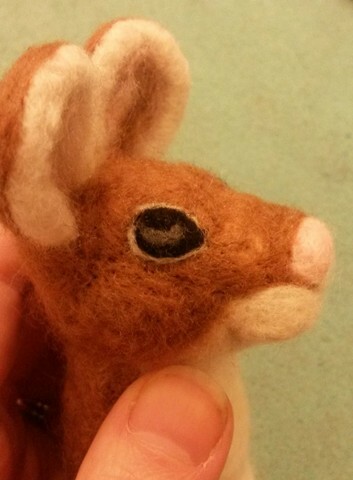 This last few weeks I set myself a challenge to make an animal with fur that has been reverse needle felted. At the moment we are staying in a lovely house in the countryside next to open fields of corn and wild flowers and we often see the cutest bunnies popping up from their burrows and skipping and playing in the sunlight. They are a delight to watch, especially when they hop away with only a flash of a white fluffy tail to be seen. 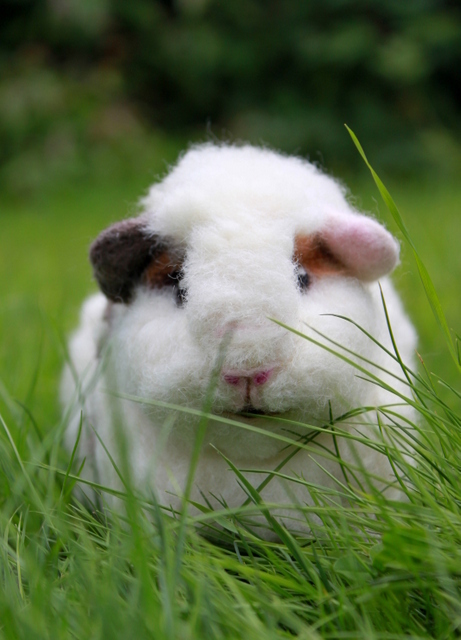 So what better animal to choose to have fluffy fur than a cute baby bunny rabbit! To me they are a real sign that spring has arrived and summer is on its way! 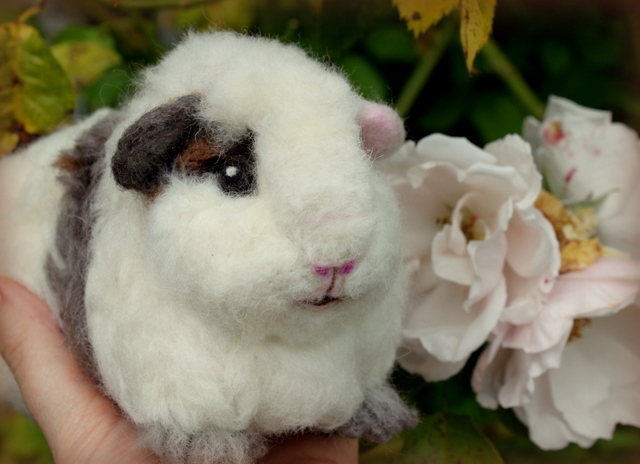 I would like to introduce you to ‘Blossom’! You can see from the photos that she is the perfect size to sit on your hand just like a real baby rabbit. 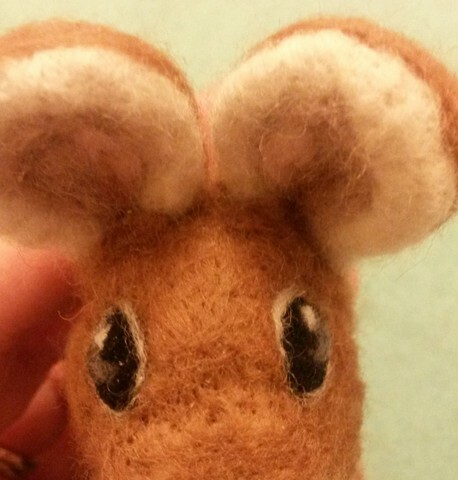 She is 15cm tall from the top of her head down to her cute bunny paws. 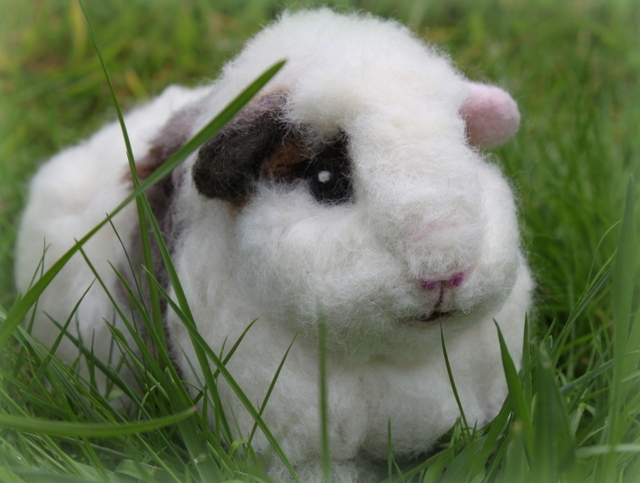 As with all my needle felted animals, it took many hours of hard work and love to give her her playful character. 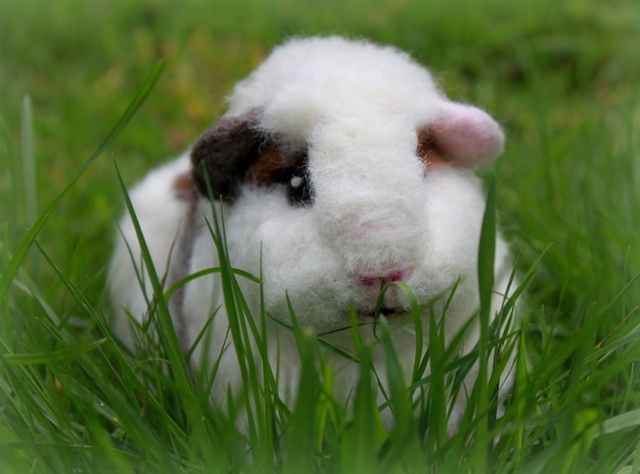 Her core is made of undyed mixed rare breed sheep’s wool from Scotland. 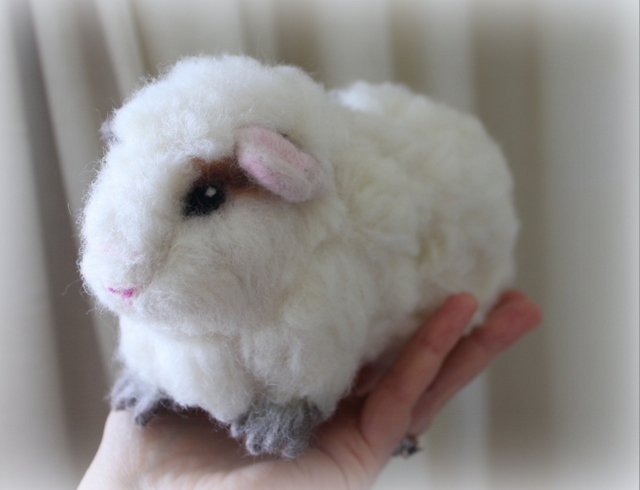 Her beautiful soft fluffy fur is a blend of merino sheep’s wool (non-mulesed) from South Africa. 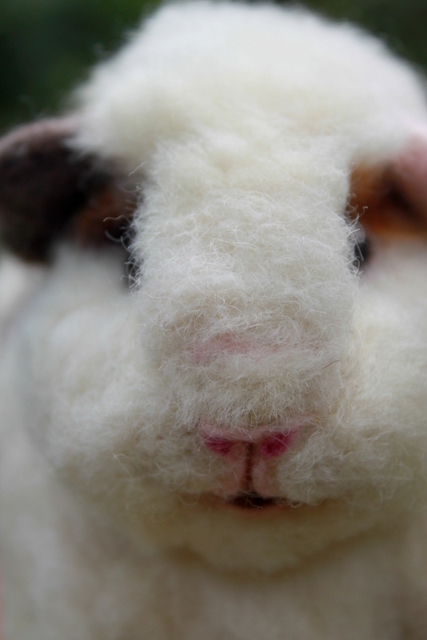 Her nose and eyes are made of wool too, so no glass or plastic. 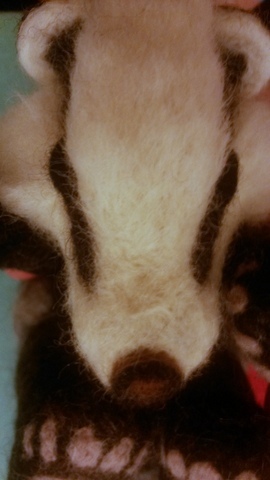 Her whiskers are made from Shetland pony horse tail hair. 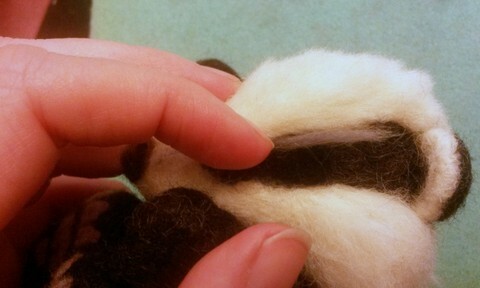 She even has pink paw pad detail when you look underneath her!…and look at that fluffy tail! 🙂 aw!! 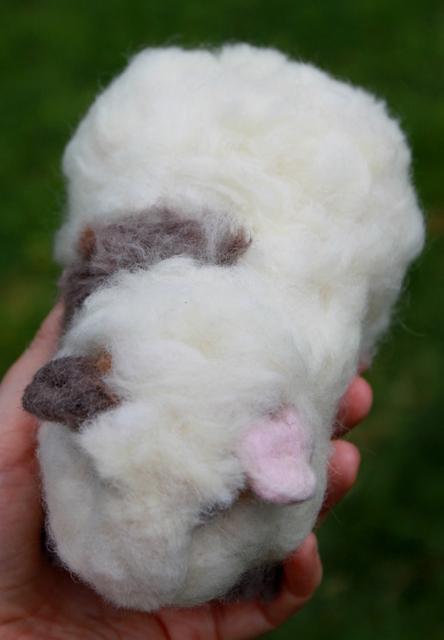 Here you can see that I made the front and back feet individually and left a tuft of core wool on each for easy attachment. 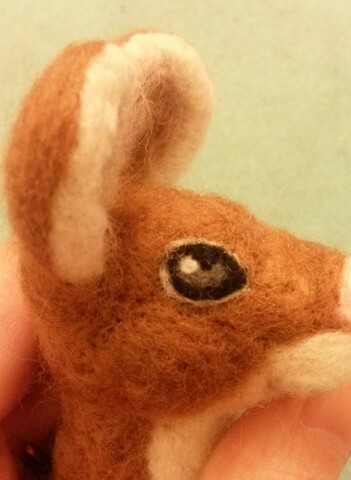 You might be wondering what reverse needle felting is? 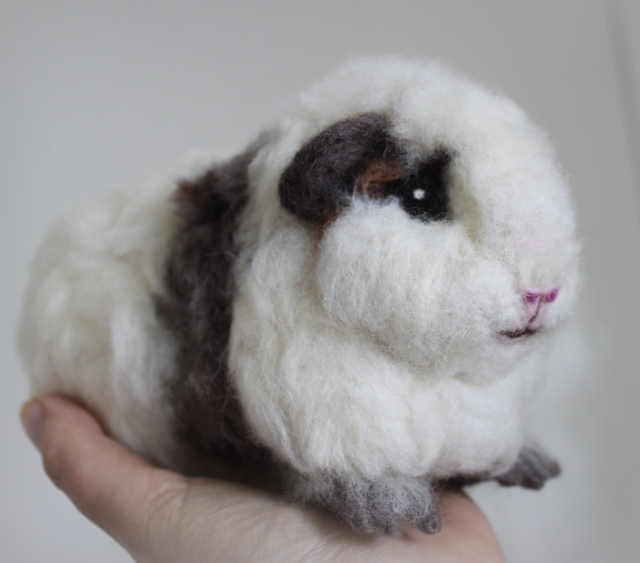 Firstly I used normal barbed felting needles to sculpt her shape with the core wool and add the colour with the merino wool. 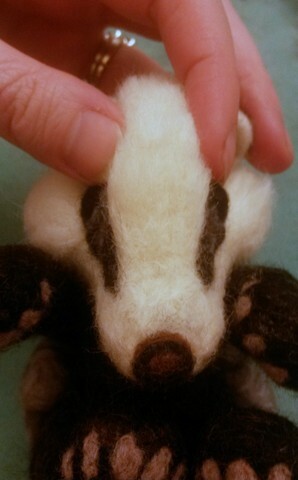 Once I had added a layer of white merino wool over her body I then added a layer of ‘pewter’ (dark grey) merino wool. 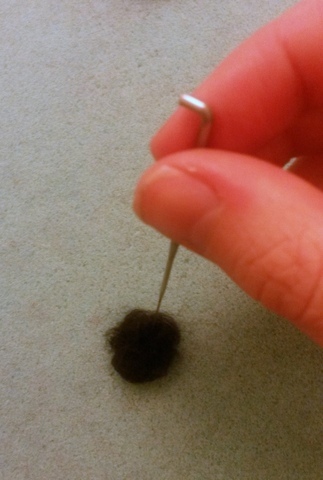 I then took a reverse needle (which has barbs going the opposite way to a normal barbed needle) and as I stabbed at the wool it pulled the white wool fibres (and some of the core wool) through the grey. This resulted in a fluffy light grey colour. 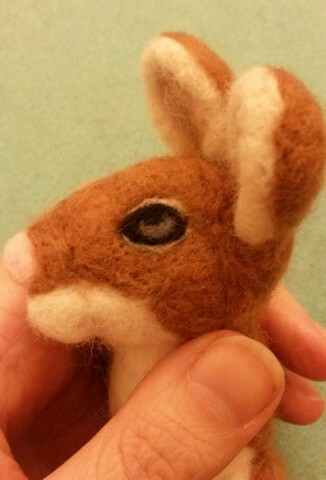 I carefully used an eye brow brush to brush the fibres in one direction to mimic the look of baby bunny fur. 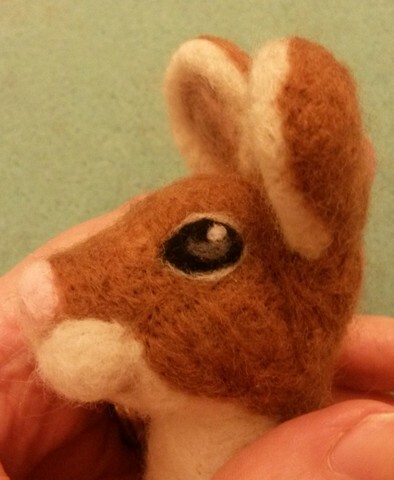 Blossom the needle felted baby bunny is now in my Etsy shop – ready to hop into your life this spring time! 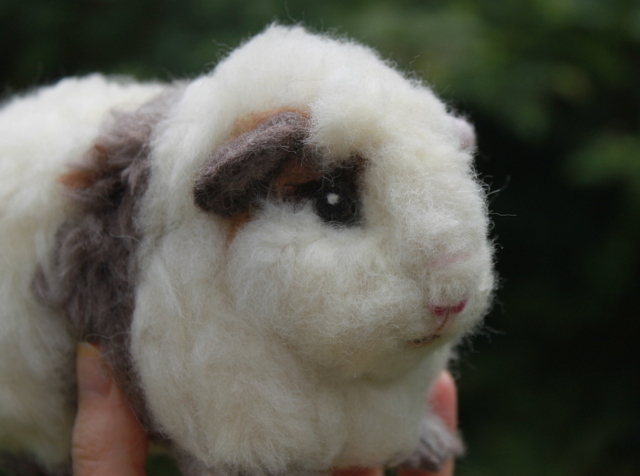 Feel free to comment and let me know what you think and if you have any questions about reverse needle felting. I hope you have a lovely relaxing Easter!! 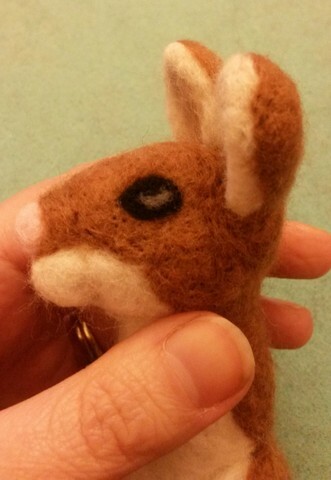 Posted in Needle felt and tagged bunny, rabbit, needle felting, gift, needle felted animals, wool animal, Spring, pet. Bookmark the permalink. 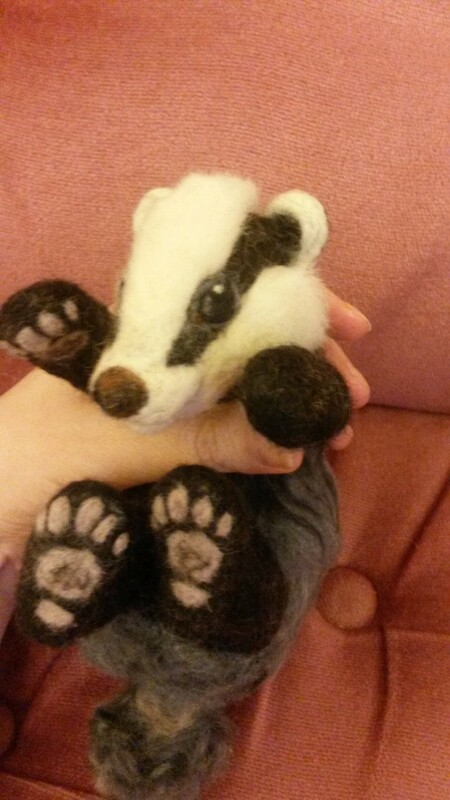 Just finished needle felting a beautiful black and white dog called Poppy. I wanted to capture the smiley faced playful character of the real dog Poppy who loves to fetch a ball, go for a swim and have lots of fun on her walks, sometimes with legs splashed with mud! I am not sure what breed she is but she looks like a spaniel/collie cross. 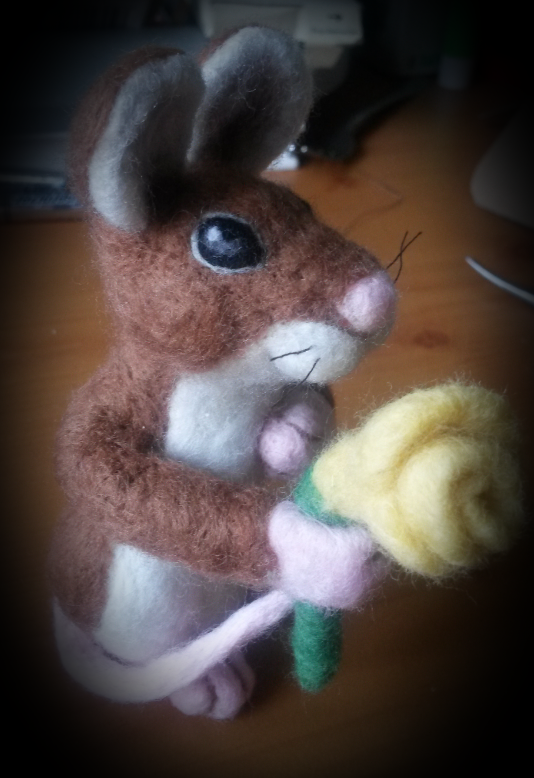 She was a delight to make. 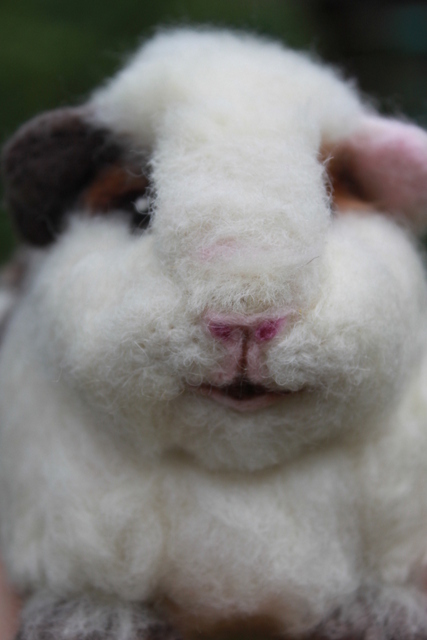 She is made from core wool over wire and then merino wool layered over the top. 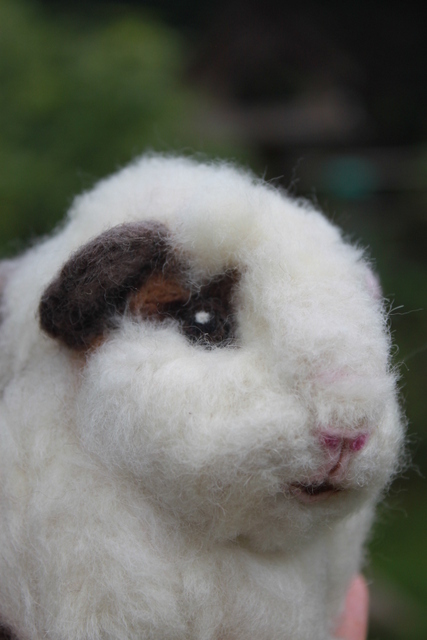 Her eyes, nose and even her tiny collar with a paw print disc is made from wool. 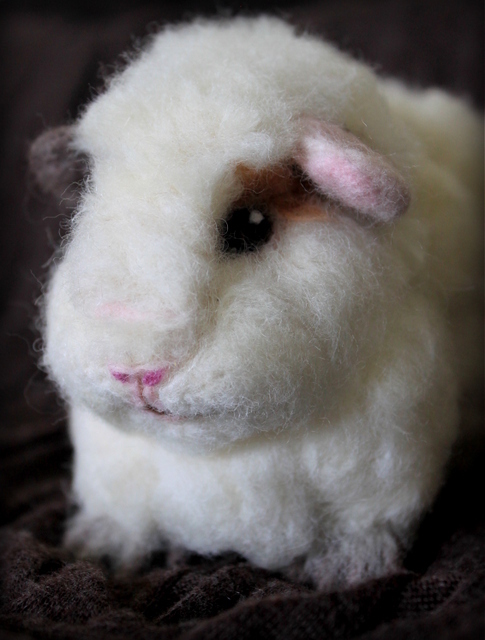 Her layers of long fur were added with my usual technique (click here for tutorial). 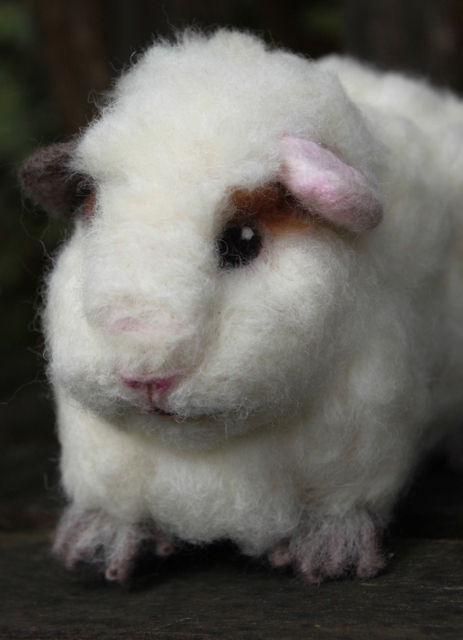 Posted in Needle felt and tagged animal, dog, needle felted animals, needle felting, tutorial, wool. Bookmark the permalink. 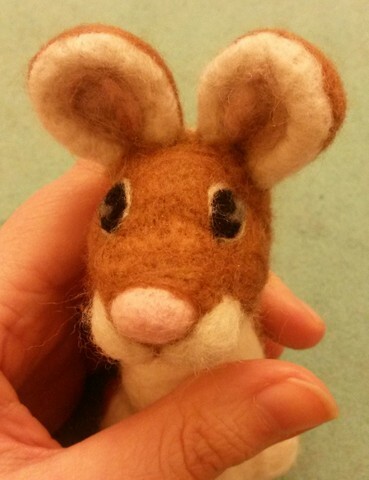 Do you ever feel like you just don’t have the time to needle felt? 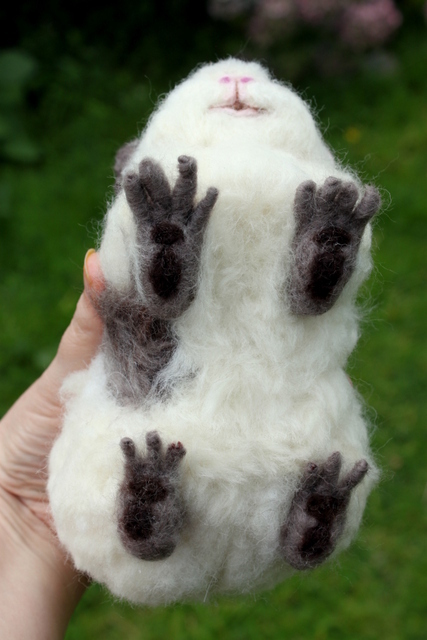 Feel envious of those amazing artists who produce several sculptures a week whilst you work hard at your full time job and dream you could be stabbing some wool but then feel too tired when you finally get home? Well you are not alone! …I really haven’t had much time at all recently. In fact I have felt so frustrated about it and have had to remind myself that I am not in a competition but this is my hobby and my style and my time. Of course seeing that end result is very satisfying but it’s time to enjoy the journey too (no matter how long it takes) !! So, the dark eyes staring back at me? 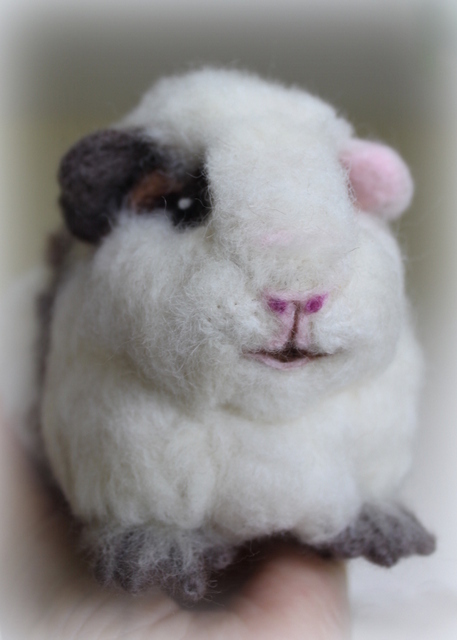 Well they would be from the little guinea pig I just finished for a very doting guinea pig lover in Warrington in memory of her precious loved guinea pig. 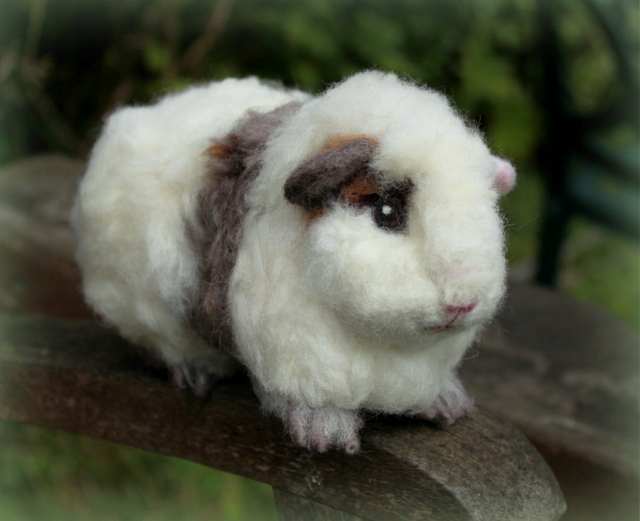 Posted in Needle felt and tagged felted animal, felted guinea pig;, guinea pig, needle felt, needle felted animals. Bookmark the permalink. 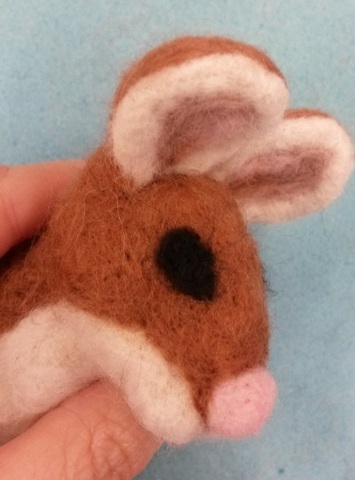 This photo tutorial will hopefully show you the basics of needle felting animal eyes and give you some ideas along the way too. 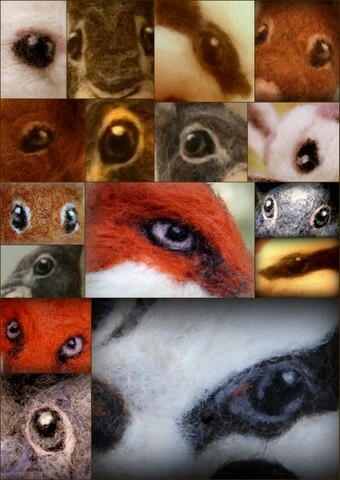 Here are some of the eyes I have needle felted so far to give you some ideas. 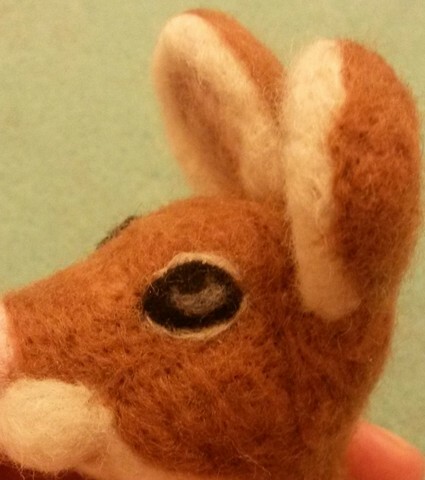 Can you work out what animals they are? Of course eyes are different for every species so the first thing to do is to take a look at photos of real animals to see how big the eyes are in proportion to the animal’s head, decide on colour, the shape, note where the light reflects etc. 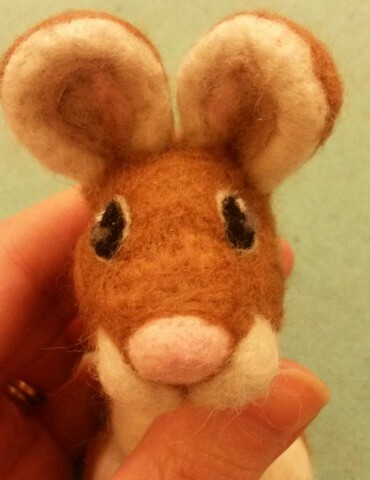 You don’t want to make the wrong sort of eyes for your animal (eg a cat’s eye on a mouse for example). 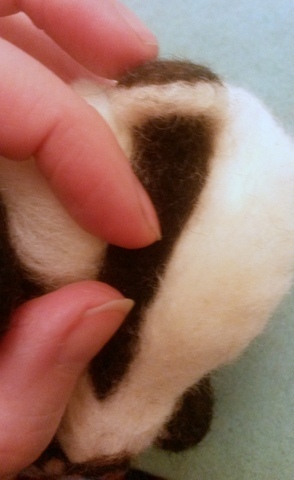 I usually just do a web search and bookmark the pictures or pin them on pinterest to refer to whilst I needle felt. 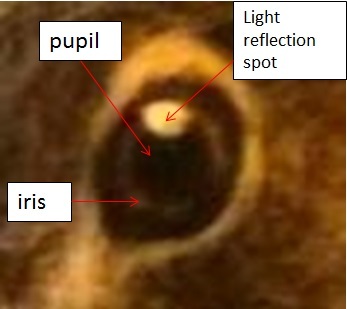 You will find that most animals will have a pupil which can change in size depending on mood/ light exposure. For some it will be round or it can be different in shape e.g. a slit for cats and reptiles, square for a goat, even w-shaped in a cuttlefish!! Some have a distinctly coloured iris, some have eye lids some don’t- birds’ eyes face forward rather than sit on the side of the head… aren’t animals remarkable! 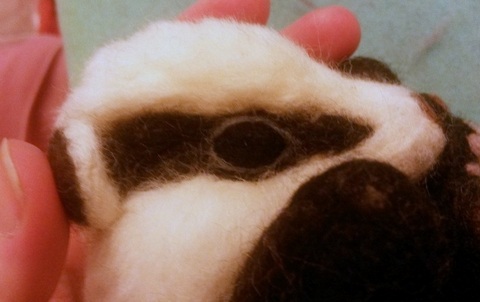 roll in warm hands 2 equal sized rugby ball shaped balls of black wool to form the basic eye shape. 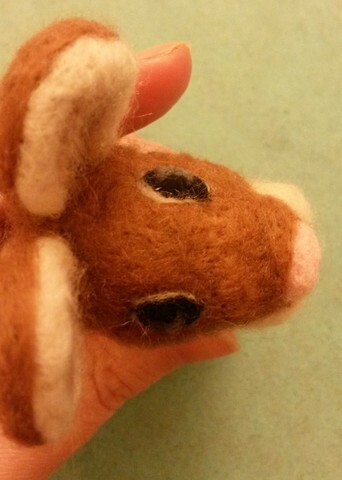 Lightly needle felt in different directions then place on the mouse head viewing from the top to check the positioning is symmetrical. 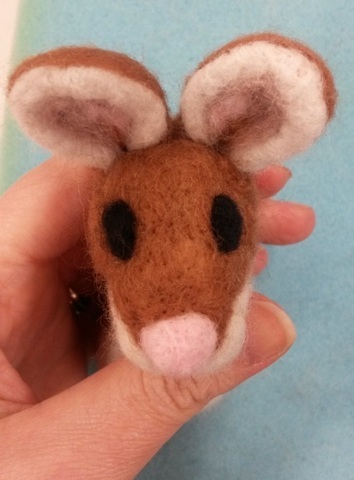 The eyes on this mouse are simple to view as they contrast well in colour with the rest of its face fur. 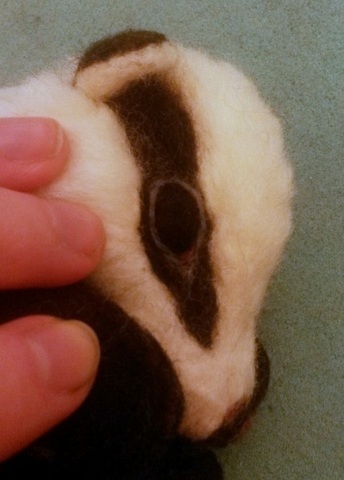 adding the pupil in this way i.e. layering one circular shape over another is far easier and less tedious than attempting to shape the iris in a half moon shape and also gives the eye a fuller shape..
this is also a good time to manipulate the wool on the eyes as well as around the eyes with your fingers to make the shape of the eyes fit the face as best it can. 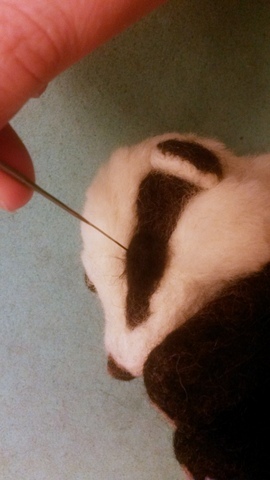 For example you could pull in the bottom corners of the eyes and narrow the bridge of the nose slightly if you choose to do so or if one eye sticks out more than the other you can carefully push it in slightly. whilst they are roughly in place view the eyes from above to check the position. 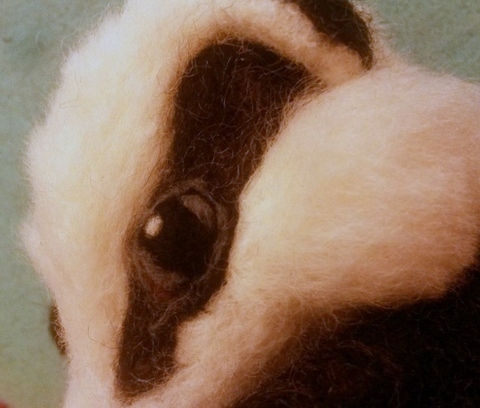 As the background fur is very dark too, you may find this hard to do so you may wish to feel the eyes too to check this..as you can see the left eye was slightly higher at this stage so I moved the eye down slightly to match..
once happy with the positioning, felt around the edge of each shape, not across its middle, to ensure the eye does not become too flat. 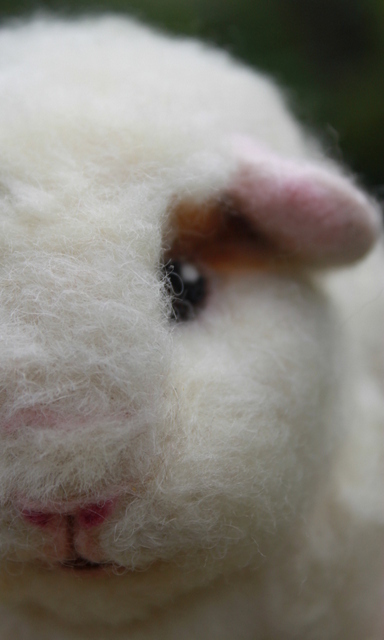 take a thin length of grey wool for the top and bottom eyelid edges for each eye, these will nicely frame the eyes. 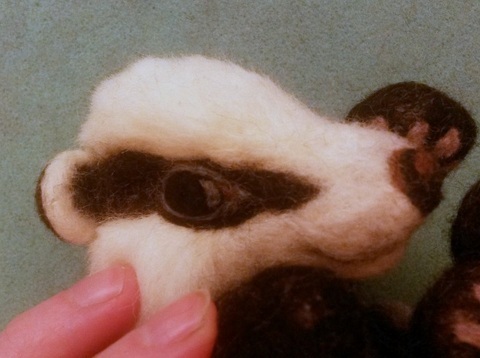 the eyes of the badger are very dark so as well as having a tiny white spot to give the illusion of a shiny eye as with the mouse, I wanted to add some grey to the sides of each black eye for extra 3D light reflecting effect. it is very important to ensure that what you do with one eye is mirrored with the other so checking from all angles is crucial. 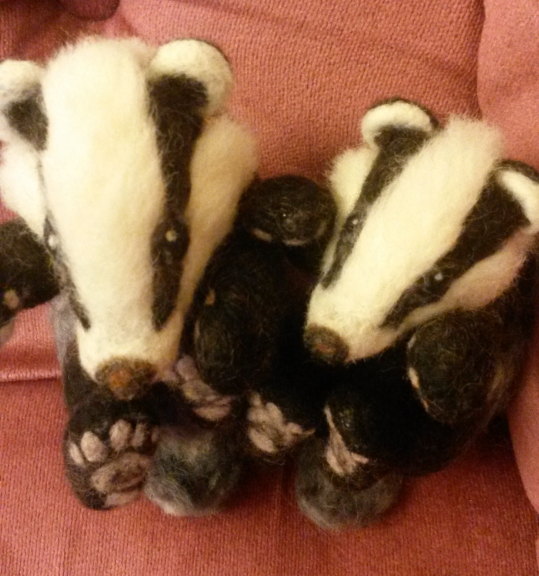 Yes these eyes can take a while to get just right but oh how cute do these badgers look when finished!! Did you find this tutorial helpful? What would you like to learn about next? Please leave comments. 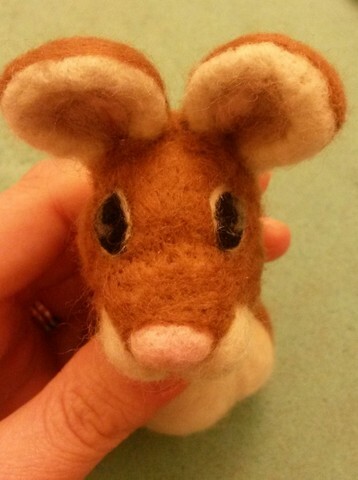 Why not post a photo of your own creations? For more tutorials like this please visit my Tutorials, tips and ideas page. 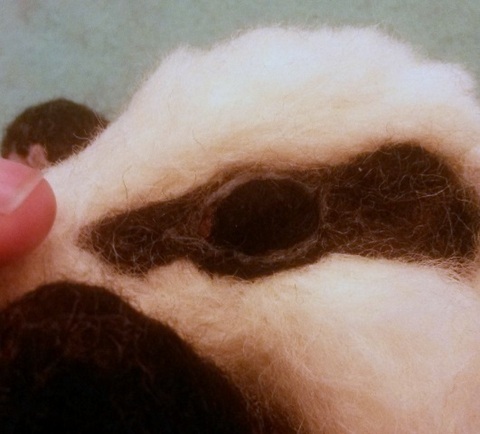 Posted in Needle felt and tagged felt badger, felt mouse, felt tutorial, felting eyes, how to needle felt, needle felt, needle felt eyes, needle felted animals. Bookmark the permalink.